Some plants prefer a soil pH on the more acidic end of the spectrum. There are additives that can be used to increase the acidity of your garden soil. 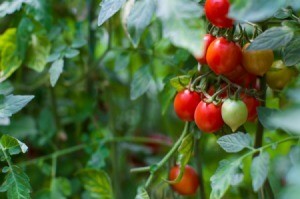 This is a guide about making soil acidic for tomato plants. I have heard that tomato plants like an acidic soil. Is this right and if so how do I obtain this? Thanks. To raise the acidity of soil, you can mix in some peat moss. You can buy tomato fertilizer that is with the Miracle Gro products, or you can buy Miracid and use it on tomatoes and on hydrangeas, rhodies, azaleas and evergreens. It is also helpful to put 1T of Epsom salts and 1t of sulfur in the hole before you plant tomatoes. Why Soil pH is So Important?